Kids Pony Umbrella PVC - Umbrellas & more from Umbrella Heaven! Do you have a little girl, who just loves ponies? Well, welcome to our Kids PVC Pony Umbrella. 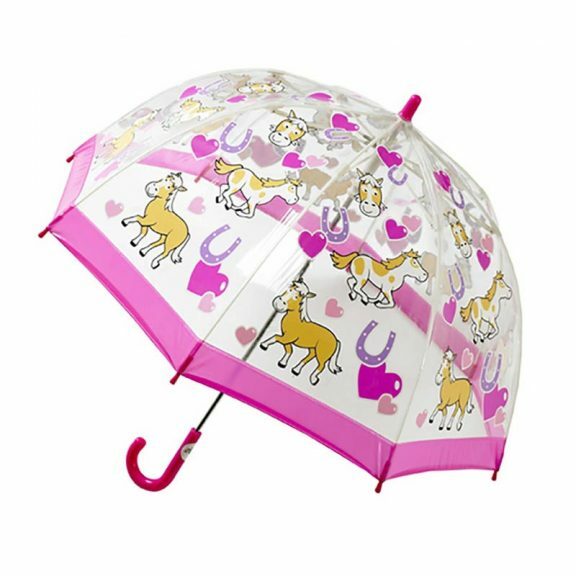 This Children’s Pony Umbrella has a herd of ponies all over the canopy and with those lucky horseshoes and pink hearts, it’s enough to raise a smile on the dullest of days. Truly the perfect gift for your little princess to be! 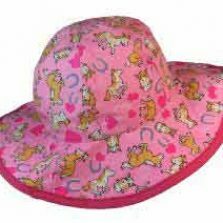 A proper fun pony umbrella for a little girl, this child size PVC dome umbrella has a soft pink stripe around the hem, with matching rounded top ferrule, safety spoke tips and handle. 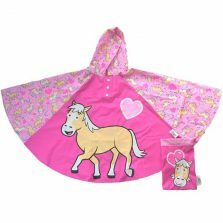 The Pony Umbrella has an exclusive safety runner for easy and safe operation for little people’s fingers. Canopy width 68 cm / 27″ and umbrella length is 66 cm / 26″. This range of wonderful Children’s Umbrellas has been tested to comply fully with strict EU safety regulations. Not suitable for children under 3 years of age. Check out our other Pony products! Not the umbrella for you? Check out the rest of our range of quality kids umbrellas!